While examples of 18th c. ladies' silk shoes like the pair, left, aren't rare (like these, these, and these), shoes with a lurid ghost story attached certainly are. 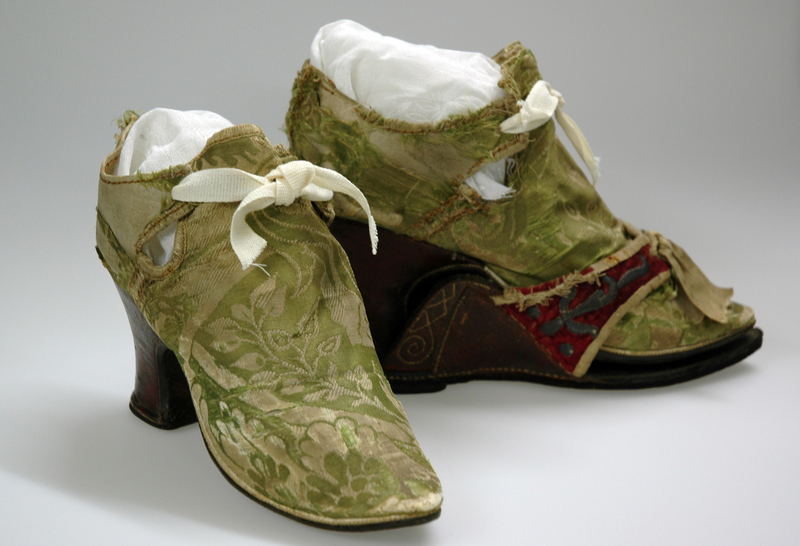 Know as the Papillon Shoes, this pair has a fascinating provenance that's more ghost story and legend than historical fact. David Papillon (1681-1762) was a wealthy courtier and the master of Papillon Hall, Leicestershire, lower right. "Old Pamp"'s reputation for drunken debauchery was enhanced with whispers that he was friends with the Devil, and that he possessed demonic powers sufficient to paralyze his enemies with a single glance. Other rumors claimed he kept a beautiful Spanish mistress at the Hall. There she was a virtual prisoner, locked away in the attic, and only permitted to walk along the roof for exercise. She disappeared under mysterious circumstances in 1717; one story had her die in the attic, cursing the house and promising death and disaster to any owner who dared remove the shoes in which she'd walked the lonely roof. Soon afterwards, Papillon left the Hall permanently to marry and live with his new wife in Kent. Some judged his haste suspicious, especially considering that he left strict instructions that certain items should never be taken from Papillon Hall. Among them were these shoes. Over the years, the Hall changed hands many times. In the mid-19th c., however, the contents (including the shoes) were left to the old owner's daughter, and removed from the house. The new owners were at once plagued with unexplained loud thumps, crashes, and voices coming from the attic rooms, violent enough to terrify the family and servants. A local clergyman recalled Old Pamp's stipulation. The shoes were found and restored to the house, and peace restored with them. On several other occasions in the next century the shoes were removed from the house. Each time poltergeist activity began and continued until the shoes were returned. The Hall was renovated in 1903, and a long-dead body was found hidden in the walls near the attic. While there was no way to know for sure if this was Old Pamp's mistress, the discovery fueled the legend, and more reports of paranormal activity with it. Even after the Hall fell into disrepair and was demolished in 1950, the mistress's curse seemed to shift to the remaining outbuildings, terrifying their inhabitants. The site was studied by paranormal investigators, who definitely came to believe in the curse. 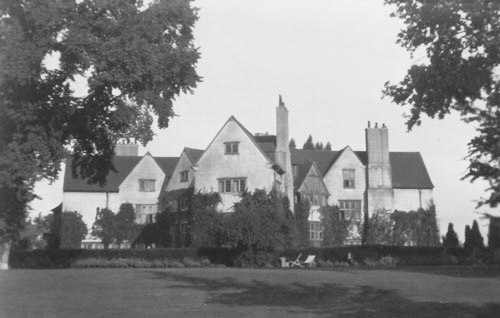 Below: View of Papillon Hall, built c. 1622, now demolished. Photograph courtesy of Lost Heritage. It's an interesting story--and thank you for pointing out how lacking in historical support it is--but I'd be curious as to what the (few?) documented facts are. As it is, this sounds like one of the more luridly embellished Victorian "histories." Fascinating. Nothing like a good ghost story. A pity that the house was pulled down, though. Did you notice the shoes have different heels? Is this unusual? The house was altered by Edwin Lutyens turning the original octagonal building into a butterfly plan playing on the name of 'Papillon'. During the building works the shoes were removed from the hall and it is reported that a number of accidents occurred and Lutyens had to employ workmen from outside the district as no locals would work there. The hall was occupied by various military units during WWII including units of the US 82nd Airborne before D-day. Despite being ordered not to interfere with the shoes which at that time kept behind a locked grill above the fireplace in the hall. The shoes were stolen twice on both occasions the serviceman who took the shoes was killed and the shoes were returned. The house was demolished in the 1950s as a result of wartime neglect and no-one willing to take it on. It is the only major Lutyens commission to have been demolished. It is not generally regarded as being his best work. When it was demolished it was only taken down to floor level, so the base of the walls is only covered by a thin layer of soil and grass. Apart from the outbuildings some of the garden walls and paths also remain. The most detailed account is 'The History of the Mysterious Papillon Hall' by Colonel Pen Lloyd published in 1977. This was the basis for the entry in 'Leicestershire Ghosts and Legends' by David Bell, Countryside Books. 1992. Some years back I did ask the curator at Leicestershire Museum Service where the shoes are stored and he told me that they are stored so that they do not have to moved to access other items. In passing one of the residents of the Hall in the 1930s was a supporter of General Franco and had gate piers at the Hall painted in red and yellow stripes to show his support.